Maxwell D. (Maxwell Davenport) Taylor, a United States Army General and diplomat, discusses briefly his Korean War experience and how that helped him in Vietnam. 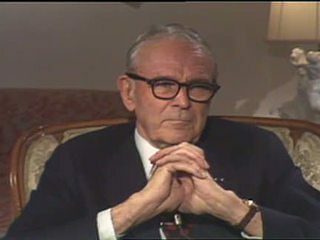 Taylor explains that when he first retired in 1959 he never thought the United States would become involved in Vietnam. Taylor recalls the Geneva Agreements in 1954 and that he disagreed with Eisenhowers decision about Dien Bien Phu. Taylor also discusses his impressions of Diem and how Taylor alleges the United States pulled the rug out from Diem, which created chaos that Taylor inherited when he became ambassador. Taylor recalls the Tonkin Gulf and the lessons of Vietnam. Chicago: “Vietnam: A Television History; Interview with Maxwell D. (Maxwell Davenport) Taylor, 1979 [Part 4 of 4],” 01/30/1979, WGBH Media Library & Archives, accessed April 26, 2019, http://openvault.wgbh.org/catalog/V_1AB9782D6F8347D9970744F452D1F0D8. MLA: “Vietnam: A Television History; Interview with Maxwell D. (Maxwell Davenport) Taylor, 1979 [Part 4 of 4].” 01/30/1979. WGBH Media Library & Archives. Web. April 26, 2019. <http://openvault.wgbh.org/catalog/V_1AB9782D6F8347D9970744F452D1F0D8>.